Bits of My Own: Foiled Again! 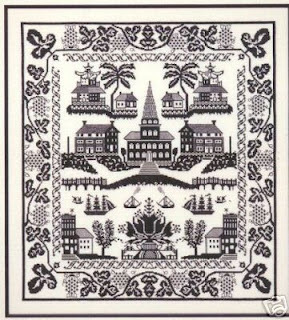 I have been trying to get ahold of the cross stitch pattern Village by the Sea for what seems like ages now! I was hoping it would be my next project. Ebay can either be a blessing or a curse! This is the third time I have been outbid on this pattern. It does not come up very often, and it stings to lose out on it! I even placed a $8 phone call to the Columbus Museum of Art. I spoke to the manager of the Gift Shop. He said that there was a Stuck exhibition several years ago, but he had no recollection of these patterns and did not think they were sold by the museum. Strange!?! 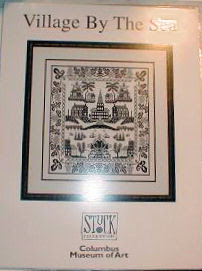 I was planning to stitch it with Needlepoint Silks (navy) on sand colored lin en. I am looking for something traditional that I could hang in my dining room. There were parts of the design that I was thinking of changing. Maybe I should just go ahead and design my own pattern! Oh course that would probably take forever! If anyone knows where I might get this pattern, please let me know.